Welcome to the The Cheese and Wine Shop. Opening times: Monday to Saturday 9.30 ish to 17.00 ish. Packed with fine foods and wines. As a specialist cheese & wines shop and one of Britain''s best cheese shops (as voted by the UK Cheese Guild) we know a thing or two about quality cheeses, fine foods and other delicacies you want to find in a gift hamper. 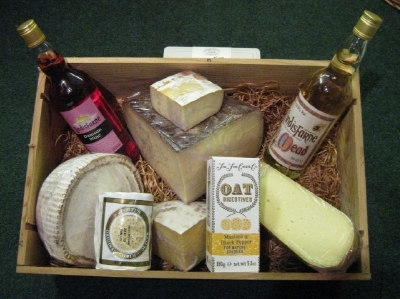 If you would like something special,either as a gift or a treat, choose one of our delectable hampers. Each one is carefully packed with your choice of fine food delicacies - all carefully hand-picked from our shop in historic Clarks Yard, Darlington. These make a fantastic gift and we send them all over the country. This Shop has been highly recommended by Tom Parker Bowles, the well known Food Writer and Broadcaster.